nebc100, yes definitely keep us up to date. I was hoping to get a tablet with built in GPS and just tether the data for maps etc. Seen some cheap(ish) stuff from Lenovo,Huawei and Samsung that could do the job. Well I’ve brought a cheap tablet (£49 Argos). It’s Lenovo so fairly good quality. It’s currently connected to the Aux with a long lead and a power lead to the socket below the climate. It’s tethered to my iPhone for data to allow the tablet to stream through the Aux (there’s even a Apple Music app for Android so I can use my music subscription). The phone can still connect to Bluetooth when tethered. OK... as promised... my American British Concepts device arrived this morning. It took quite a long time to arrive, but it is finally here. Support from the manufacturer was excellent because I was concerned that the part had gone missing. They responded very quickly!! The installation video makes it look as though the part can me installed in about 30 seconds, and THEY ARE NOT WRONG!! I installed it at the side of the road in less than a minute!! I have now connected my Android phone (not tested with an iPhone) to it, and it connected immediately, and I have now set my phone to use the building LR Bluetooth for phone calls, and the ABC device for streaming. To use it, I simply select the AUX input on the radio, and I can now play music through the phone. The sound quality is as good as any other system through the audio system. There doesn't seem to be any loss in quality. When you are not playing anything, there is no hiss/buzz/crackling etc like there is if you leave just a cable attached to the aux socket. Understandably, the "forward" and "back" commands don't work from the steering wheel. The USB sockets seem to work for charging. I don't know how fast they charge, but I am not too worried about that as it will only be my daughter using them in the back seats. I haven't tried the aux in, or the mic input on the device as I don't actually plan on using either of them, but a mic was supplied with the kit so it would be possible to use this as a full hands-free kit if wanted. Overall, I am very pleased with it. It does exactly what I wanted. I can now stream music to the audio system of the car without having to plug in cables. Price..... it is not cheap, but it is the cheapest solution that I have seen that still looks "factory" and doesn't cost a fortune. After reading this and other feedback I purchased the Kinivo BTC450 from Amazon and installed it this morning. Plugged into the rear AUX port and USB, cable run along center console and button mounted using the supplied sticky pad to dash. The first connection to my Android phone took a couple of attempts but has worked automatically every time since. Call quality better than anything I got using the standard LR connection. Now using Android Auto on the phone, I have hands free calling, with no requirement to keep pairing the phone! I have music streaming INCLUDING the DAB radio stations like 5 Live, I also have Spotify and Amazon Music. 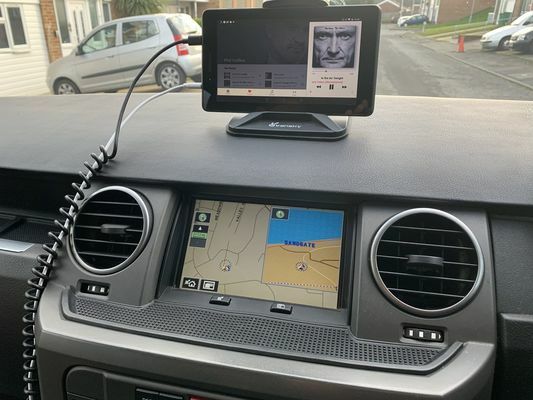 All via the one connection, all subject to steering wheel volume control, simply have to select the AUX button on the LR hi-fi. Cheap, easy and removable if required, must have good phone and data limit though to make the most of it. good to hear, I think the Kinivo is brilliant, and £30 you cant go wrong.